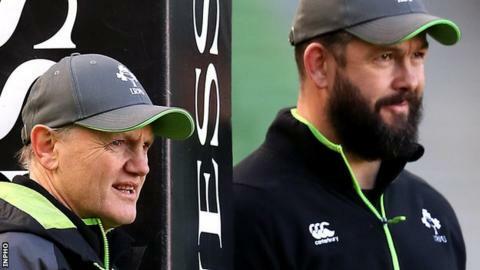 Joe Schmidt is to stand down as Ireland's head coach after the 2019 World Cup and will be replaced by current defence coach Andy Farrell. Schmidt, 53, said he had decided to finish coaching and focus on family commitments. He has been with Ireland since 2013 and this year guided them to their third Grand Slam and a first victory on home soil over New Zealand. "I feel that Irish rugby is in good hands," said Schmidt. "The management and players have been incredible to work with and the tremendous support we have had, particularly at home in the Aviva, but wherever we have travelled, has been uplifting." Farrell, 43, joined the Ireland set-up in April 2016 as defence coach, having previously had a four-year spell as England assistant coach. The father of current England international Owen Farrell, he was a dual code player who won eight England caps after switching from rugby league to union. Before his role as assistant with England, Farrell coached Aviva Premiership side Saracens. He was also a defence coach for the 2013 series-winning British & Irish Lions tour to Australia. "It is a privilege to be considered for such a prestigious role," he said. Schmidt, who had been tipped as a likely successor to New Zealand coach Steve Hansen, backed the appointment of Farrell as his successor. "The coaches have been fantastic to work with and Andy has made a big impact since coming into the group," the Kiwi said. "His ability to lead and his understanding of the game will ensure that the group will continue to move forward." Schmidt, who led Ireland to Six Nations titles in 2014 and 2015 as well as 2018, has masterminded both of Ireland's victories over New Zealand, including the 16-9 win in Dublin earlier this month. He also guided his team from eighth to second in the world rankings in five years at the helm. Ireland reached the quarter-finals of the 2015 World Cup during Schmidt's tenure but will hope to reach at least the last four for the first time in 2019. Schmidt said last week that he had been "beating myself up about a decision that's been a long time coming". "I know I can't continue to go backwards and forwards. The family I have probably committed most to is this family that I live with in Carton House [Ireland's training base] as much as it is the family I have at home. Before Monday's announcement, former Ireland captain Paul O'Connell said the Irish Rugby Football Union should make it "financially irresponsible" for Schmidt to leave his post. "His coaching style and philosophy is filtering down into all the provinces," O'Connell told Matt Dawson's Rugby Show on BBC Radio 5live. "It's filtering down into schools and into underage rugby. It's having a massive effect on Irish rugby in general. "So it's not just the results he delivers with the national team that mean the IRFU gets great value when they pay him whatever they pay him, it's the effect he seems to be having further down the game as well." Since taking over five years ago, Schmidt's impact on Irish rugby has been seismic, with the one blemish being the deflating quarter-final exit at the World Cup in 2015 - something he will be desperate to remedy at next year's tournament in Japan. Schmidt had been talked about as the next All Blacks boss, but says instead he will step away from coaching because of family commitments, leaving Ian Foster as the clear favourite to succeed Steve Hansen. Andy Farrell's appointment as Schmidt's successor is also hugely significant. Sacked by England in 2015, his coaching resurrection is now complete - with this news quashing any chance of a return to Twickenham in the near future.